Fully upgraded condo with cherry wood wrap around cabinets, sleek black countertops, stainless steel appliances, and colorful backsplash. 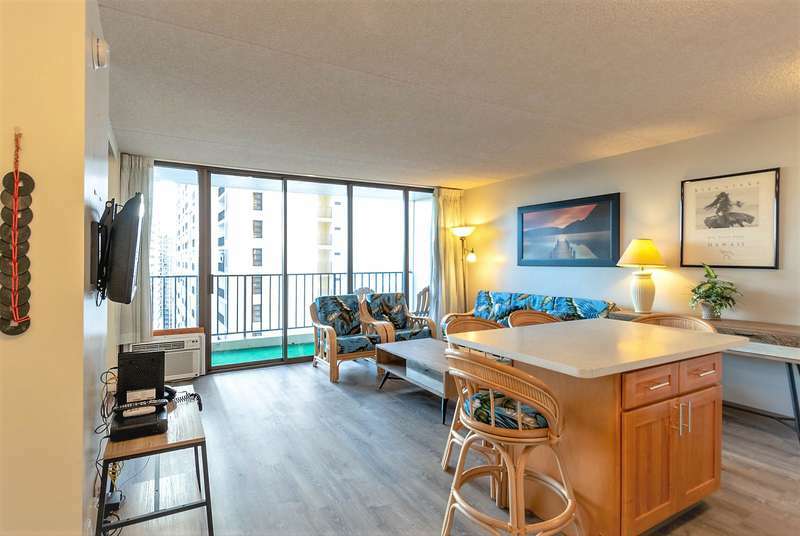 This condo has a great view of the pool and recreation deck from the lanai (balcony). This unit books up quickly! 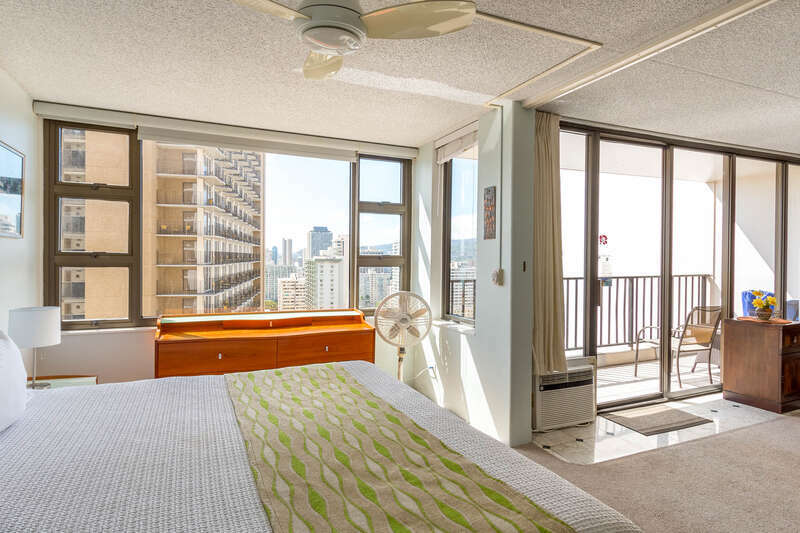 Get all the comforts of home for less than you would typically pay for a hotel room in Waikiki. Enjoy a fully equipped kitchen. Kitchen includes refrigerator, range, microwave, rice maker, coffee maker, and other kitchen wares. As a bonus, this condo has a Keurig coffee maker. There is an eat-in kitchen with a table that seats four people. This unit features a separate access door to the bathroom from the kitchen which provides greater privacy to the bedroom occupants. 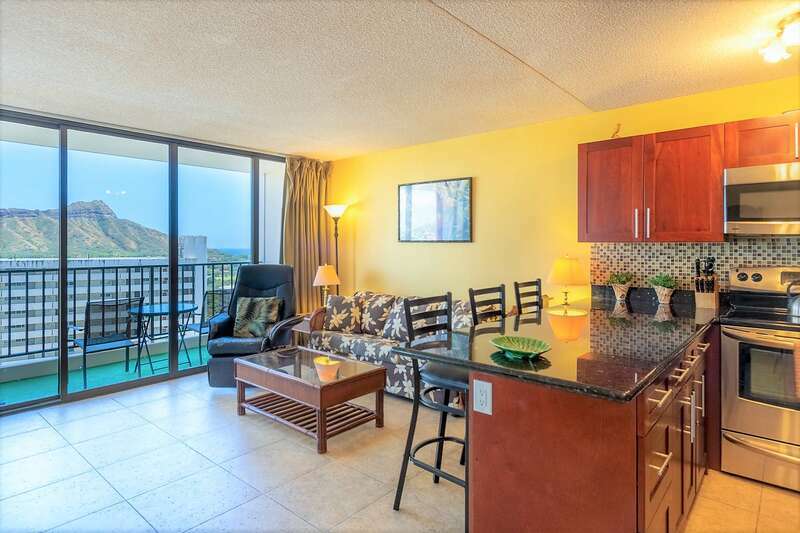 Sleek tile floors throughout - clean and sanitary. Relax with a large flat screen TV in the living room with comfy seating, including a recliner. Convenient sleeping arrangements include a queen-sized bed in the bedroom and a sofa sleeper in the living room. The bathroom is completely modern and luxurious - a Rain Head and hand shower along with sliding glass doors and a built-in shelf.